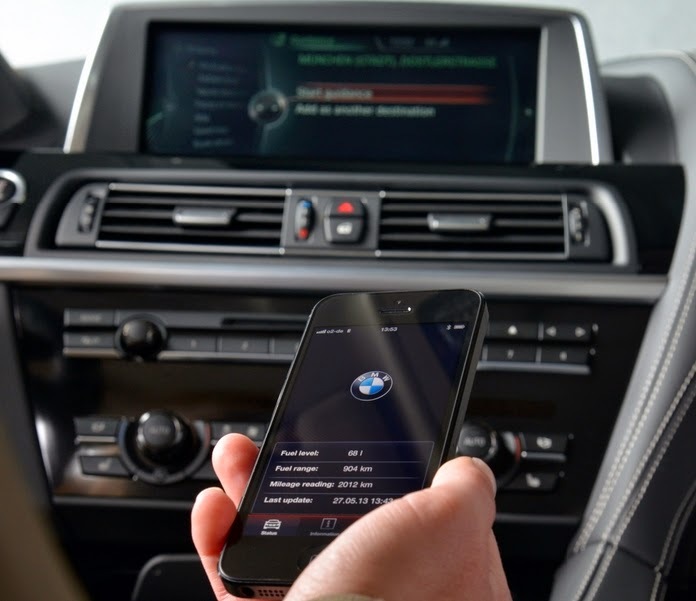 BMW integrate a SIM card in all new models of the brand. And this becomes the cornerstone of its ConnectedDrive environment. It is simple. You enter the vehicle and connect your smartphone wired (via a USB port, integrated under the center armrest). Then applied via the ConnectedDrive the user finds his environment in the central display board of the car. Many apps are then available (Deezer, Napster, etc.) and use the connectivity of the smartphone to work. On the other hand, it is the SIM card of the car that takes over all other infotainment services such as Real Time Traffic Information, RTTI. Moreover, electronics takes place increasingly significant in cars. At BMW, this requires HUD (you can find speed limits, speed and information about your journey on the windshield), but also the integration of screens for the rear passengers.